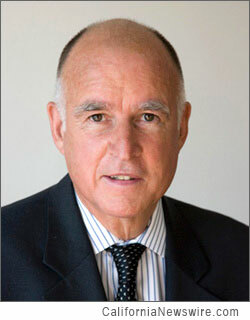 LOS ANGELES, Calif. /California Newswire/ — Governor Edmund G. Brown Jr. yesterday signed SB 1029, which will create thousands of new jobs in California by modernizing regional transportation systems and linking them to the state’s future high-speed rail line. The $4.7 billion investment will be matched by an additional $7.9 billion in federal and local dollars for statewide improvements to transportation in California. Governor Brown signed SB 1029 at the historic Union Station in downtown Los Angeles, the site of one of the many regional systems receiving funding through this legislation. The Governor also appeared later in the day in downtown San Francisco at the future site of the Transbay Transit Center. Both of these stations will serve as major hubs of the future high-speed rail line. One of the many infrastructure improvements funded by this legislation includes a 2-mile light rail connection that will be built in Southern California to link existing Metro transit and provide a one-seat ride to Union Station. Construction is scheduled to begin in April 2013. In the Bay Area, improvements include more than $700 million to modernize the Caltrain system with electrified rail that is ready to connect to high-speed rail by 2019. These improvements leverage more than $2 billion in additional matching federal and local funding. In 2013, construction of the initial segment of high-speed rail, linking Merced to the San Fernando Valley, will create 100,000 job-years of employment over the next five years, the equivalent of 20,000 full-time jobs annually. SB 1029 invests $4.7 billion of state bonds to improve regional rail service statewide and help commuters arrive where they need to be faster. These funds include a $2.6 billion investment (matched by additional federal funds) for construction of the high-speed rail corridor. California will receive an additional $7.9 billion in federal and local funds for transit systems that provide over 950 million trips per year. • Positive Train Control, an automated safety system designed to stop train collisions. Including matching federal and local funds, SB 1029 ensures approximately $3.6 billion of economic investment in Northern California, $2.8 billion in Southern California and $6 billion in the Central Valley. SB 1029 imposes additional reporting requirements on the High-Speed Rail Authority to improve accountability, manage project risks and keep construction on schedule and within budget. California voters authorized the bond funds in 2008 by passing Proposition 1A, the High-Speed Rail Act. For the full-text of SB 1029, visit: leginfo.ca.gov/bilinfo.html. For additional information on local transportation improvements in the Bay Area and Southern California, visit: www.cahighspeedrail.ca.gov/.